Setting expectations with your friends or family might be the most important step of any road trip. Is everyone okay with stopping frequently? Do you have enough time between destinations? How will you split up driving time? How will you split gas? Do you want to stop for meals or plan ahead? Have an open conversation and make sure everyone is on the same page before setting out. It will save you from any silly arguments and make the whole road trip much more enjoyable! Before heading out on any road trip, make sure you have the car and tires checked. Having a licensed mechanic give your car a once over before heading out is a great way to catch any issues before they come up and save you a headache. Is it any surprise that we recommend bringing a paper map or atlas on any road trip? Even in the digital age it is still a good idea to have a backup map or atlas in case your phone’s battery runs out or your GPS accidentally leads you down the wrong path. Plus, a physical map can be a lot more exciting and kids love it! Trust us on this one - planning your road trip route before hand will actually give you more freedom to be spontaneous. It will save you time and allow you to do more research of the surrounding area. If there are nearby sites that you’d like to visit, you can work them into the route or just give yourself plenty of time in case things come up. Along with knowing your route, this is key! On any good road trip, you want to give yourselves plenty of time for spontaneity or a detour. This way, if you pass something on the road worth stopping for, no one will feel bad about making the stop. Instead, it will be all about the journey and experiences along the way! Don’t underestimate a good playlist. It will help keep up the energy in the car and make sure everyone is enjoying themselves. When we can, we like to create playlists based on the regions we are traveling to or through. Road trip basics: bring snacks. You do not want anyone cramped up in a vehicle, getting hangry. Plus, bringing snacks will save you unnecessary stops as well as a few bucks along the way. Are you planning the perfect road trip? Do yourself a favor and grab an Adventure Assist Travel Notebook to help you plan the trip and stay organized as you go! We all like a little extra cash in our pockets but it's not always easy to balance a big trip while balancing your bank account. That's why we are offering up some of our best tips on how to save money while traveling. Unfortunately, we can't always be flexible with our travel plans.. But if you're able to have flexibility with your travel dates and times, you can set yourself up to find the best possible deal around the time you'd like to travel. Furthermore, it often pays to be flexible with your destination as well. Keep your eyes peeled for flight deals and error fares, and maximize the opportunity to save some money. This is travel hacking 101. Join rewards programs for airlines or hotels you frequent. Sign up for that credit card that gives you a ton of upfront points. We advise to do a little research on this one, and be careful to only use credit cards responsibly, but this is a way to save big with travel. By traveling in the offseason or shoulder seasons means less demand and lower prices. This is true for travel expenses, accommodations, food, tours and more. Sometimes traveling in the offseason has disadvantages too but we like to target shoulder seasons to maximize the best of both worlds. If you're trying to save money on your next trip, you may want to get creative with your accommodations. This could be as simple as staying at an Airbnb instead of a hotel or, to take it a step further, try couchsurfing or a house swap. A common mistake travelers make is seeking out cheap accommodations that are far away from the attractions they are wanting to visit. There is know set rule but it helps to understand the price of general transportation in your travel destination and taking that into account when booking your accommodations. An easy and fun way to save money while traveling is to shop at local markets and grocery stores. Not only will you save money, but you will get a cultural experience as well. After picking out your food at the local market, save some cash and cook it for yourself! Eating out for every meal adds up quickly, so even making just a few meals for yourself can really help you save some money while traveling. Next time your on a tour or even just exploring, plan ahead and bring your own snacks and water. If you don't, these expenses will add up, especially if your in a touristy location or on a tour. Traveling where you have friends is always a great experience. Not only do you get the inside scoop on the travel destination but you also may be able to save money by staying with your friends and not getting stuck in tourist traps. It's not always easy to save money while traveling but hopefully these tips will keep you one step ahead and put some extra money back in your pocket! Planning a trip!? Get an Adventure Assist travel notebook today and take some pressure off of the planning. Want to travel journal to remember an upcoming trip but are a little intimidated, or think it may require too much time or effort? We are here to help. Here are a few quick techniques to get the ball rolling. These don't take much time or skill but will help you hold on to your travel memories. Start simple. Maybe for you that means, one line per day that embodies your experiences for that day. Some days you'll have much more to include but if you don't there is no pressure to write a long entry. Just because you are keeping a travel journal doesn't mean you have to treat it like a diary. Maybe you can draw really well and would rather fill your journal with sketches. Or perhaps you want to include a local recipe, or song lyrics. You could even stick to pictures, ticket stubs or postcards. Chances are you will have some down time while traveling and journaling is a productive way to fill some of that time. Take advantage of your layover or a long train ride to get some writing in and maybe you won't feel so much pressure to write at other points during your trip. A straightforward way to travel journal is to include lists or bullet points. This could be as simple as listing the things you did that day, food that you've tried, or activities that you are most excited about. This typically requires less creativity and gets the writing process started. At the end of every day, write something that you were grateful to experience on your trip. This is a great way connect with your travel destination, and afterward, allows you to remember exactly how you felt during your trip. There are a lot of reasons to keep a travel journal, but hopefully these suggestions help if you aren't sure where to start. Need the perfect travel journal for your next trip? 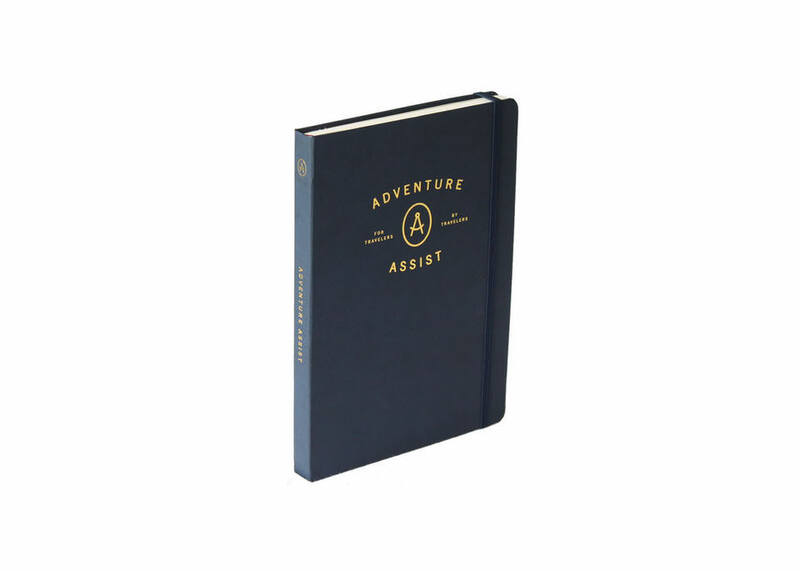 Get an Adventure Assist travel notebook to plan, organize and journal everything you want to remember in a beautiful keepsake. The first step in any travel planning process is choosing the perfect destination for your trip! There are a lot of things to consider when choosing a travel destination (and travel planning in general), so we're here to share some tips that we use to decide where we will be heading next. The very first thing to think about when choosing the perfect destination, is what you want to get out of your travel experience. We are big believers in giving your trip purpose because it will inspire you throughout the travel planning process (and while on your trip) and give you something incredible to look forward to. Do you want to discover a new culture? Do you want to become more knowledgeable on a specific subject (European history, wine, Kung Fu)? Or, do you just want to relax and reset? Giving your trip purpose by setting expectations or goals is a great way to get you in the mindset for your trip and help you narrow down destinations that make sense. Since you now understand what you want to get out of your trip, you’ve probably narrowed your search down quite a bit. What’s next? How do you actually decide? When planning your next travel destination, it is always important to consider the time of the year, seasons, and weather in any potential destinations. Is it the busy tourist season or slow season? Is it warm and sunny or does it rain most of the day? Are there any events or festivals that you should be aware of? Another consideration while deciding on your next travel destination is any activities that you've always wanted to do! What are your bucket list items that you can check off on this trip? Do you have recommendations from friends and family? Are there any life changing activities that you can do? For most of us, the biggest factor in determining a travel destination is the cost. Does the expense match what you are expecting to pay for the trip? Often the biggest expense of a trip is the price of flights and other transportation. Remember to also take into account day to day expenses like the price of accommodations and food. Additionally, you'll want to account for any activities that you will want to do while in your destination. Still stuck in your travel planning process? If you're still undecided on where your next travel destination should be, we recommend searching the internet for the best places to accomplish your travel goals, scouring travel blogs for the perfect spot, or checking out social media to see where might be a good fit. Travel planning can be overwhelming. If you're planning a trip, simplify your travel planning process with the Adventure Assist travel notebook. One of the most rewarding aspects of travel is experiencing new cultures. In our experience, this is one of the biggest areas for personal growth that traveling can bring. Experiencing new cultures not only gives you a practical understanding about the world and its history, it will even teach you some things about yourself. When we say "cultural immersion", we mean the act of integrating oneself into an unfamiliar culture, interacting with people within that culture, and attempting to understand their way of life from that perspective. If you are seeking cultural immersion on your next trip, here are some of our tips. One of the simplest ways to experience cultural immersion while traveling is to stay with a host family during your trip. Staying with a host family offers an intimate view of another culture that you just can't experience any other way. Engaging in normal activities together, such as eating dinner or playing a card game, can really make you feel like an extension of the family. Not to mention this is a great way to keep up with your foreign language skills. Learning a foreign language is hard work, but it can be especially fulfilling to use your language skills to navigate a new culture. Being able to speak a foreign language (or sometimes even just a few words and phrases) can offer a dramatically different travel experience. If you're looking for an authentic experience off of the tourist circuit, speaking the language is a huge advantage. It's important to note that cultural immersion is also the easiest way to learn a foreign language. If you are surrounded by people speaking the language, you don't really have a choice except to learn and improve! Public transportation can be a great way to experience a new place. You learn to navigate your new surroundings from the perspective of the locals. It will help you to understand people's daily routines and maybe you will strike up a conversation or two. It's a big bonus that it's usually the cheapest mode of transportation. If you love to cook, a great path to cultural immersion is learning to make local cuisine! Most travel destinations have classes, taught by a local chef, that teach you how to make different types of local dishes. Additionally, if you are staying with a host family or if you've made local friends, you could always offer to help make dinner. This is not only an opportunity to learn about various cuisines around the world and how they are prepared, but also a chance to spend time with locals and develop friendships. Participating in group activities, joining a club or playing sports are all amazing opportunities for cultural immersion. You will spend time with members of your host community, learn more about traditions and customs, and people will know a little bit more about you based on what activities you choose. If you're going to be somewhere for an extended trip, seek out some local activities to get involved with while you're there, and even if you'll be there for a shorter while you could always join that pickup soccer game! Heading out on an extended vacation? Remember every last detail with an Adventure Assist travel notebook.